Many great dynasties of reptiles rose and fell during the early phases of the Mesozoic Era (a hefty block of geological time, sometimes called the “Age of Reptiles”, that lasted from 250 to 65 million years ago). The beaked rynchosaurs, the agile, erect-walking, predatory rauisuchians, the crocodile-like phytosaurs and armored aetosaurs all had their heydays within the first 50 million years of the Mesozoic. The names of these lineages – successful though they were – are probably only familiar to professionals and die-hard enthusiasts. The same cannot be said of the ever-popular Dinosauria, whose first (relatively unassuming) representatives also appeared on the scene during this early-Mesozoic time interval, around 230 million years ago. The Dinosaur clade has attained tremendous public notoriety for its evolutionary experiments in large body-size, defensive weaponry and bipedal carnivory, as well as for its sudden fall from planetary dominance about 65 million years ago. Dinosaurs have penetrated the public perception of prehistoric life so completely that the casual museum-goer is prone to indiscriminately identify any large, extinct reptile on exhibit as a dinosaur. The term “Dinosaur” refers to the members of a specific branch on the greater tree of reptile evolution – it is not a blanket descriptive term for anything extinct, gigantic and ostensibly reptilian. None of the early Mesozoic reptiles I mentioned in the opening paragraph are dinosaurs. But what distinguished the earliest Dinosaurs from their non-Dinosaurian reptile contemporaries? Are modern-day crocodiles close relatives of dinosaurs? Answering these questions is not trivial and will require a fair amount of phylogenetic tree-climbing. Dinosaurs have two openings on each side of the skull behind the eye sockets. These holes, called temporal fenestrae, have margins that provide secure anchorage points for muscles involved in jaw function. The presence of these paired holes in the skull roof places dinosaurs within the group Diapsida. All living reptiles –with the possible exception of turtles and tortoises – are Diapsids by ancestry. The skull of a primitive diapsid. Two holes, called temporal fenestrae, are situated behind each eye-orbit. – A group of reptiles that includes lizards and snakes in addition to a number of now-vanished creatures, such as the spectacular marine Mosasaurs. This group is formally called the “Lepidosauromorpha” and is of no further concern to us in this account of Dinosaur origins. 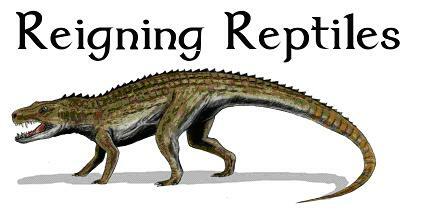 – A group that includes modern crocodillians, avian and non-avian dinosaurs, flying reptiles called pterosaurs and a bewildering assortment of lesser known extinct reptiles with varied body-plans, diets, native habitats and temporal ranges. These are the “Archosauromorpha“. – An opening in front of each eye-orbit called the “anorbital Fenestra”. – Teeth that are “laterally compressed” – that is, flattened from side to side – and serrated. – A large protrusion on the femur, called the fourth trochanter, that serves as an attachment point for a set of thigh retracting muscles. – Various anatomical characteristics that indicate an upright or semi-upright limb posture, as opposed to the sprawling limb posture observed in modern lizards. One of the main thrusts of my post is this: the earth was already inhabited by a wide variety of impressive, large terrestrial reptiles – most of them archosaurs or close relatives of archosaurs – when the first dinosaurs made their appearance on the evolutionary stage. Phytosaurs were semi-aquatic, crocodile-like archosaurs from the early Mesozoic. They had elongate snouts and jaws rimmed with conical serrated teeth. Unlike modern-day crocodilians, they had nasal openings positioned high up on the skull – close to the eye-orbits in many cases – rather than at the tip of the snout. One can envision them snagging unsuspecting prey on the edges of rivers and lakes. Aetosaurs were herbivorous archosaurs armored in heavy, interlocking dermal plates. It is tempting to think of them as prehistoric armadillos. Many were armed with fearsome spikes and stout claws. Rynchosaurs were strange plant-eating relatives of the archosaurs that had barrel-shaped bodies, stocky limbs and strong beaks that could cut through plant matter. Before the ecological ascent of the theropoda (the dinosaur group that includes Tyrannosaurus rex, Velociraptor, and practically every other famous meat-eating dinosaur) the biggest land predators on the planet were Rauisuchians. They are generally understood to have been active, toothy, largely quadrupedal* archosaurs related to modern crocodiles. They were erect-walking animals with limbs oriented vertically below the body, rather than jutting out sideways – one of several traits they share in common with dinosaurs. The head of the femur fits into a downward-facing socket in the hip girdle called the acetabulum. The largest raiusuchians hit a length of over 7 meters, far bigger than the carnivorous dinosaurs of their time, and hunted large game. The first “true crocodiles” also appeared during the early Mesozoic. Modern-day crocodiles and alligators are built for a low-energy, semi-aquatic lifestyle. Crocodiles walk, for the most part, with a sprawling, lizard-like gait and spend hours basking on river-banks in a state of absolute intertia. Many early Crocodillians were, by contrast, slender-legged and fleet-footed terrestrial creatures. Some of them were even herbivores! Crocodile evolution is a fascinating story in its own right and will be dealt with more fully in a future post. Crocodillians, Raiusuchians, Aetosaurs and Phytosaurs can be readily distinguished from dinosaurs on the basis of their ankle morphology. 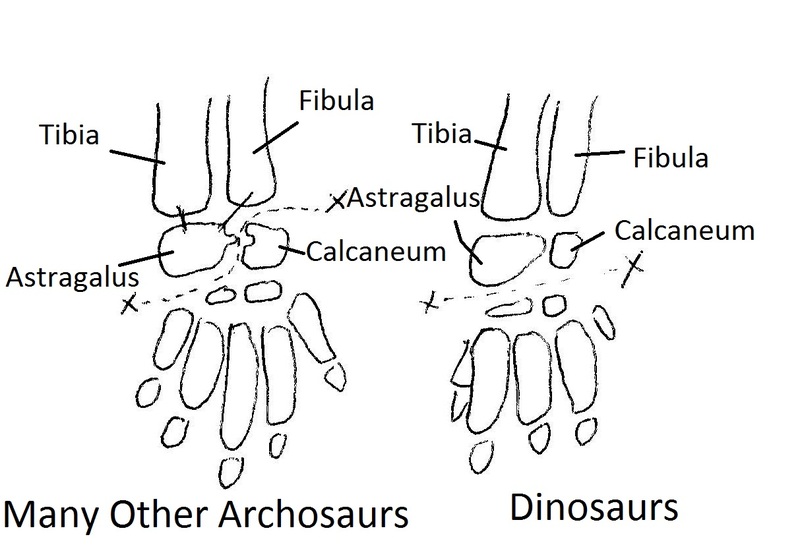 In the former groups, the functional ankle joint is situated between two foot bones of similar size: the astragalus (an bone that forms part of the ankle; in these archosaurs it is sutured to the two bones of the lower leg, the fibula and tibia) and the calcaneum (heel bone). This configuration allows for considerable rotation of the foot during locomotion. In Dinosaurs, however, the articulation between the ankle bones is modified to produce a simple hinge joint. The functional ankle-joint is between the upper bones of the ankle (the calcaneum and astragalus) and the bones immediately distal to it (refer to diagram). The calcaneum was very small compared to the astragalus. The important implication of this anatomical design is that the foot was restricted to motion in a vertical plane. In other words, it could move back-and-forth but could not be twisted. This is a clear adaptation for upright, speedy running. A similarly structured ankle is also found in pterosaurs. Pterosaurs are aerially adapted reptiles and close relatives of dinosaurs. Both the Raiusuchians and the Dinosaurs independently evolved an erect gait (where the limbs were positioned directly below the body rather than splayed outwards), but their anatomical approaches to this condition differed. Three bones make up the pelvis: the pubis, the ischium and the illium. At the junction of these three bones, there is a socket into which the head of the femur fits called the acetabulum. 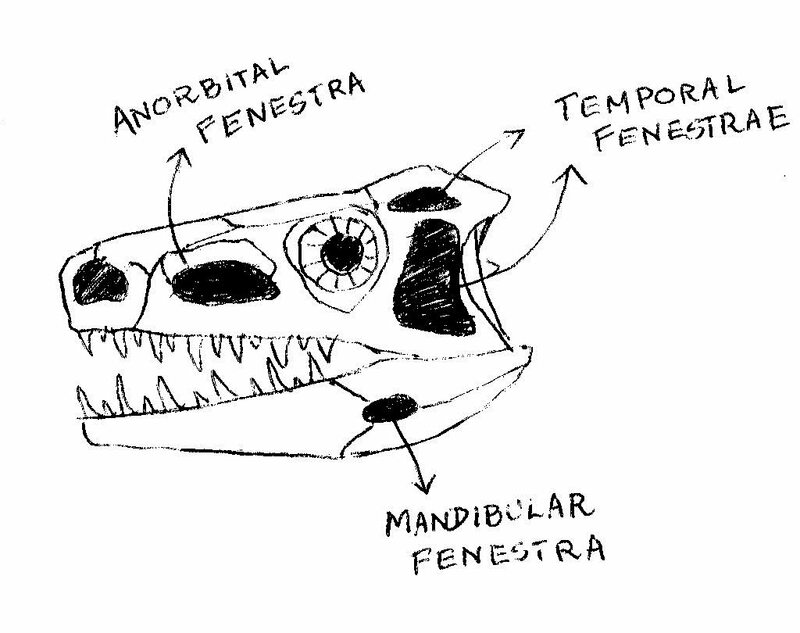 In Dinosaurs, the head of the femur is bent – that is, offset at an angle to the main body of the bone. The head fits into the acetabulum. The dinosaur acetabulum, rather than being a solid pocket of bone, actually has an opening in it (an open acetabulum is one of the defining features of the dinosaur clade). The dinosaur femoral head is rather more barrel-shaped that the bulbous head of the human femur, limiting thigh motion to a plane parallel to the body. 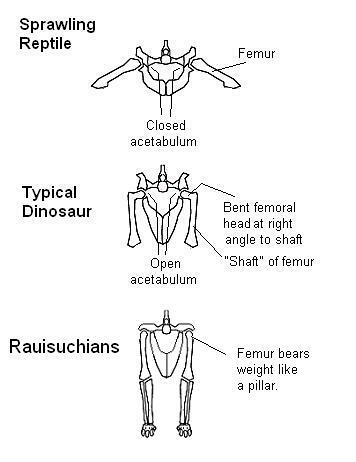 Comparison of the primitive reptile, dinosaur and rauisuchian hip configurations. Adapted from skepticwiki’s article on dinosaurs. The oldest known dinosaurs from the fossil record are lithe, bipedal carnivores like Staurikosaurus and Herrerasaurus. One of the interesting implications of this ancient bipedal body plan is that quadrupedal dinosaurs from later ages – horned Triceratops and mighty Brachiosaurus among them – belong to lineages that had to revert to walking on four legs from a state of two leged-ness at some point in their evolution. Herrerasaurus, one of the earliest dinosaurs. Art by Nobu Tamura. 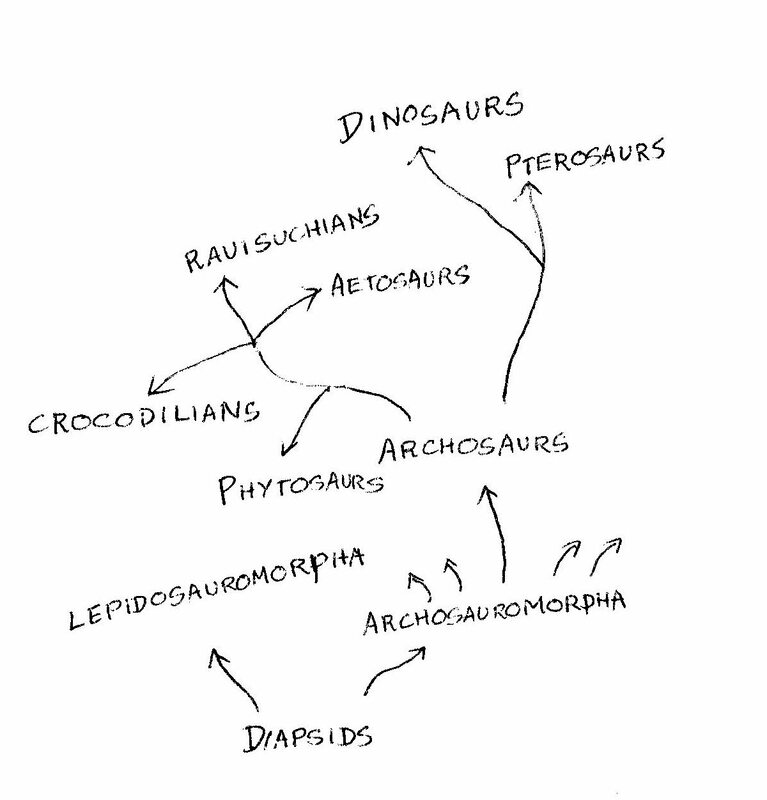 On the road to upright-walking bipedalism, the dinosaurs evolved a host of anatomical features that, taken in summation, set them apart from the rest of reptiledom. These include a distinct neck, a backward pointing shoulder joint, a hole in the center of the acetabulum, longer hind-limbs than forelimbs and long lower foot bones and digits. Dinosaurs did not comprise a significant portion of terrestrial animal diversity for much of the early Mesozoic, but they eventually supplanted the raisuchians, aetosaurs, rynchosaurs and other reptile groups as the dominant vertebrates on land. Their spectacular success would last them through the middle and later Mesozoic – and beyond, given that birds are modern day descendants of dinosaurs. But what made the ascent of the dinosaurs to ecological preeminence possible? Some researchers have suggested that the upright-walking dinosaurs may have been more efficient terrestrial locomotors than their sprawling gaited and semi-sprawling gaited contemporaries – and that this was crucial to their long-term evolutionary success. Others have opined that the evolution of warm-blooded physiology in early dinosaurs may have given them a “competitive edge” over other reptile groups. It seems likely, however, that the meteoric rise of this scrappy upstart clade had more to do with luck than any inherent superiority. After all, a number of other archosaurs evolved an erect gait but did not diversify to anywhere near the extent that the dinosaurs did, nor did they survive past the early Mesozoic. The fossil record suggests that two large-scale mass extinction events took place during the early Mesozoic, successively culling the landscape of various groups of large reptiles and transforming vegetation planet-wide. Early dinosaurs just happened to scrape through these tough times and inherited a world deserted of major competitors. *There is evidence for at least facultative bipedalism in a number of raiusuchians. 1. Lucas, Spencer G. Dinosaurs: the textbook. McGraw-Hill, 2004. 3. Fraser, N. I. C. H. O. L. A. S., and DOUGLAS HENDERSON. Dawn of the Dinosaurs. Indiana University Press, Bloomington, IN, 2006. If I were to hop out of my time machine 225 MYA I bet the the first thing I would notice was that I couldn’t catch my breath after a short walk (and the lack of grass, ants, flowers, etc). Mid-Triassic oxygen levels bottomed out to 15-16%. Maybe those bipedal Archosauria were the only ones who did not need to gasp for air as they ran down the last remaining sluggish and gasping dicynodontia, or me if I was foolish enough to go back to the Triassic unarmed. It is surrounded by countryside on three sides and by a sea lough on the other.